I took this photo a few nights ago. The text from a woman I met ONCE, 3 months ago, arrived on my phone screen on the Monday evening of 7/10/17. It read : "I can loan you $10k right now if you need it. All is going to work out and fall into place for you. Believe it. But let me know if you need a float. I have it." She had read my last full moon post in which, after recounting my current life circumstances and including the quote from Einstein "The most important question you can ever ask is if the world is a friendly place", I asked for comments about why the readers believe the world is a friendly place. I received an outpouring of sweet comments and offerings of support (including one from my mother that still makes me cry every time I read it), but my situation was far from resolved. 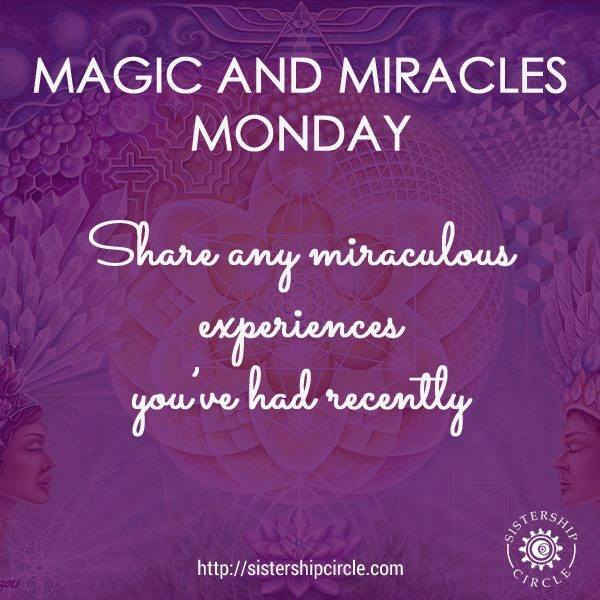 Earlier in the day, I had shared the Facebook post below, with the request "I could use some reminders of magic and miracles today. Whatcha got for me, friends?" 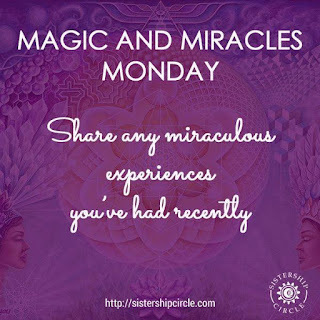 It turned out to indeed be a Monday of magic and miracles and so I am sharing my miraculous experience with you in the hopes that you can benefit as well. 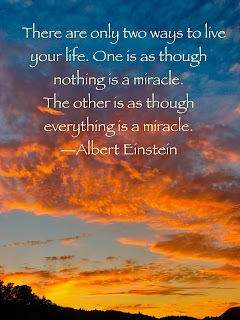 Because if a miracle is possible for anyone then miracles are possible for everyone. Here are some miracle tid-bits. Oxford defines a miracle as "a surprising and welcome event that is not explicable by natural or scientific laws and is therefore considered to be the work of a divine agency"
The etymology of the word "miracle" is from mirari "to wonder at, marvel, be astonished,”... earlier smeiros..."to smile, laugh" (source also of Sanskrit smerah "smiling," Greek meidan "to smile,"
I like this definition from ACIM: "A miracle is just a shift in perception from fear to love." This astonishing, marvelous, surprise and welcome event of the text out of the blue certainly made me smile and shifted my perception from fear to love. I also learned the origin of the phrase "jaw-dropping", as my mouth literally kept falling open every few minutes that evening --a nice change from my recent tensely clenched jaw, furrowed brow and tight shoulders. The benefits of relaxation cannot be overestimated. Me shortly after receiving the text. Furthermore, it felt Divine in nature to me, because this Deux Ex Machina ("a seemingly unsolvable problem is suddenly and abruptly resolved by the inspired and unexpected intervention of some new event") renewed my faith that rather than being alone in a cold, hard world, the Universe really does have my back. I could not have planned or predicted this happy occurrence. It makes me wonder what other unplanned blessings are on their way to me and on their way to you! Those of you who are skeptical of all of this "miracle" and "friendly Universe" nonsense may think me delusional. I have moments when I doubt all of that as well. But those moments, for me, tend to be my darker times, when I doubt myself and doubt many things that I increasingly know in my heart and deep in my bones to be true. During those times, not only am I less happy, but my intuition is turned off, things do not flow well for me and I am less able to be productive. I also notice this heavier mood is contagious to others. This is not to say that I (or you) should always be skipping blithely with sunny smiles. Dark and light times are part of the natural cycle of our lives. And sometimes jaw-dropping surprises can be disastrous events. Both kind of surprises serve the purpose of getting our attention and raising vital questions. 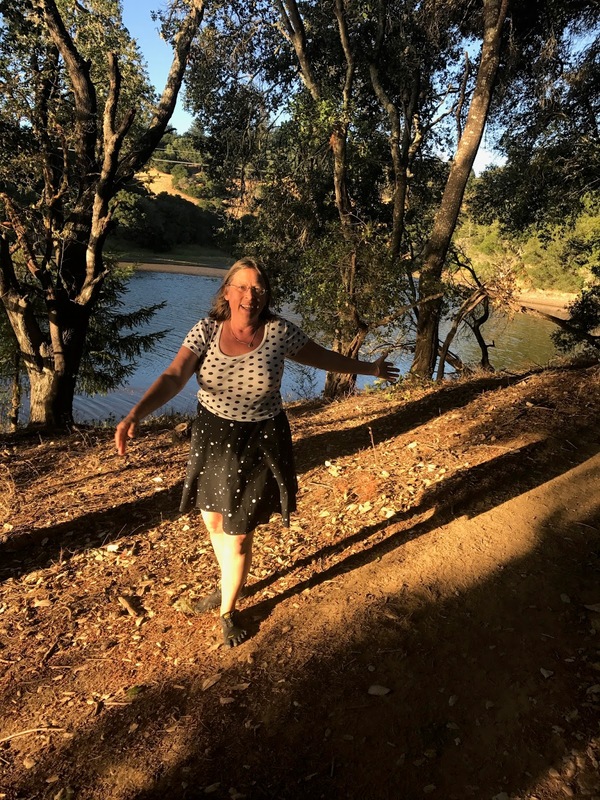 I have experienced so many incredible and astonishing happenings, that it's getting harder to not believe them to be miraculous, even when I am feeling fearful. This does not mean that I will lounge with my feet up waiting passively for more manna to fall from the heavens* or that nothing but happy miracles will come to me in the future. I know some "blessings in disguise" await me. And some may be devastating. I deeply love a whole lot of people, all of whom I will lose to death (unless I go first). And there are of course many unforeseen tragedies and minor mishaps ahead. 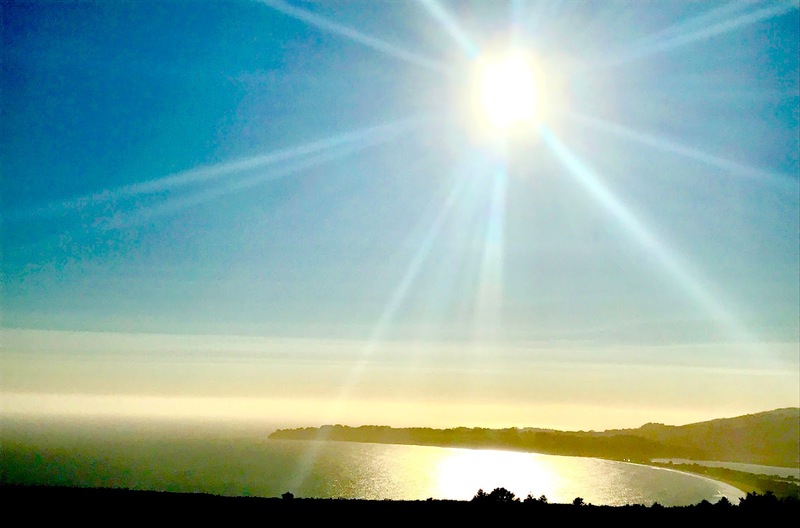 But when I trust in the benevolent nature of all of these occurrences, I am able to relax just a little bit more every day and look for the gifts instead of feeling paralyzed by the fear of my survival conditioning. 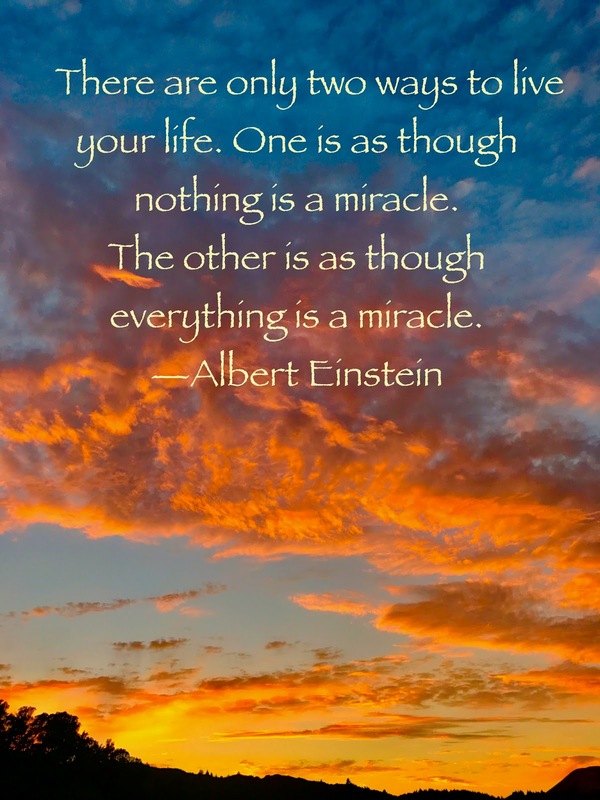 The more I welcome what I believe to be miracles and define them as such, the more they come to me. They're also accompanied by ever-increasing joy and delight. Given my lifelong history of depression and anxiety, this definitely feels miraculous to me! And what is even more miraculous is that I can find joyful and truly grateful moments even in the midst of my greatest fears. I invite you to consider everything in your life so far that you could possibly define as a miracle --and then to invite more to come to you. You just never know what is possible! On the day I took this photo last week, I unexpectedly saw more whales and seals than I could count. I continue to celebrate the miracle of being alive and living here! *I just accepted a part time nanny position. Full time would not have allowed me to pursue something more long term sustainable and would have been soul-crushing. Just living on that 10K (which I considered with the thought that I could devote every minute to creating the livelihood that is the best use of my quirky gifts) would have put too much pressure on figuring something out --FAST, which I've already learned is a total buzz kill! So this is my compromise. I did NOT want to take another nanny job (for so many reasons), but I thought long and hard about it before making a one year commitment. It feels like the right thing to do, so I'm going to embrace it and be the best damn nanny I can possibly be! I am also going to be making some changes in my overflowing life (especially in regards to screen time and extra curricular activities) for at least three months, to make room for both the new job and my creative process. I have been way too easily distracted by all of the wonderful people and enticing events in my world. So please support me in being more still, focused and grounded, even if it means a little less connection with those of you who are my friends and family. I know I've said this in the past and then always succumbed to the lures of engaging with emails, Facebook messages, texts, and invitations. Like the alcoholic falling off the wagon, I'm getting back on again. If you see me hanging out at the equivalent of the bar or the liquor store, feel free to gently remind me to go Home --to the present moment. Thank you! On the day I took this photo last week, I was seeking clarity about the job situation so I hiked to the top of a big hill for a clearer view of the world. It worked! 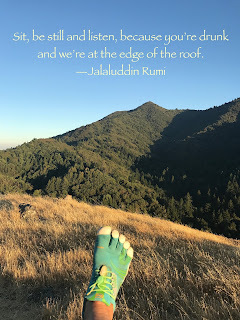 I am loving this Rumi quote lately, not just for my life but for all of us right now.